Are You Reluctant to Show Off Your Hearing Aids? I love the idea of coming out with our hearing aids and not being ashamed of them. There are too many cool hearing aids out there now to hide them. A few years ago, I attended a graduation party. I was in the kitchen with several people I didn’t know. I told them I was hard of hearing—that way they knew they might have to repeat. Conversation slowed as if they were embarrassed for me, so I told them I had really cool hearing aids! I whipped one off my ear and showed it to them: translucent red with black trim. When I looked up, all mouths were hanging open. They couldn’t believe I shared my hearing aid with them. I laughed! The look on their faces was priceless. They asked more questions about hearing loss after that. I hope I showed them hearing loss is nothing to be ashamed of. 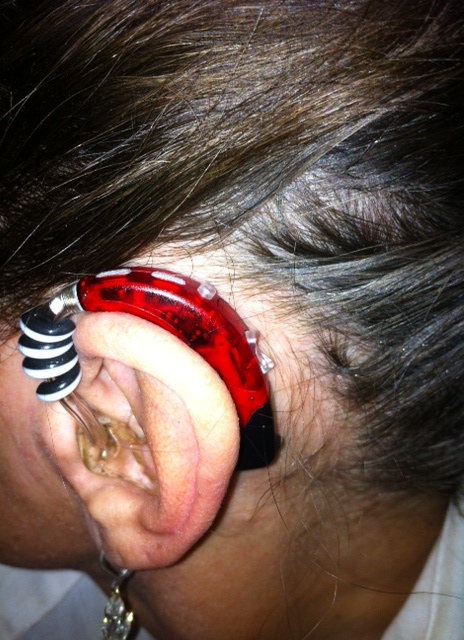 Chelle wears her hearing aids with flair! Do you wear your hearing aids or cochlear implants with flair? 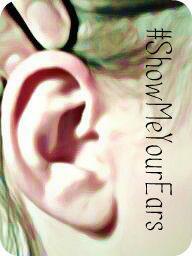 If not, Lipreading Mom encourages you to…then send me your ear photo for SHOW ME YOUR EARS! I love the color and the way you designed it. I just got mine last night so I haven’t had time to get creative yet. Good photo and thanks for sharing. Can’t wait to see your hearing aids, Jeffrey! Liz – Thanks for the study info. I’m sure this number is the same or even higher now….hopefully! Those are cool! I am amazed at how different they are since I wore them! And that was only 7 or 8 yrs ag!!! « Are Your Eyes Your Ears?